This past August, I completed my tour of all the states that seceded from the U.S. during the Civil War by visiting South Carolina for the first time. Outside of a few cities in the region that appear to be thriving, my personal observations fully agree with more systematic evidence documenting the terrible conditions in the South in terms of health, education and economics. This situation is not sustainable, and is having very negative consequences for the entire country. It is long past time for the federal government to develop and implement a vigorous solution. Before I proceed, here is a disclosure. I am a member of the Sons of Union Veterans of the Civil War and the direct male descendant of an Irish immigrant who entered the U.S. in exchange for enlisting in the U.S. Army (his wife also had to enlist as an Army nurse to become an American). My ancestor served from December 1861 through February 1867, and fought throughout the war under General Sherman. I do not come at the topic of this column from a perspective of a dispassionate outside observer. Here is a partial inventory of negative outcomes in the South that stand in sharp contrast to the rest of the country. Education. Counties in the South generally have the lowest percentage of adults having graduated from high school. Pooled data from U.S. Census Bureau’s American Community Survey from 2010 to 2014 presents a comprehensive view of this disparity (to see a map of the data, go here). We all know higher paying jobs in the 21st century require education above high school, yet in many counties in the South about half of the adult population did not finish high school. Economic outcomes. A study of social mobility used measures to compare children with the economic outcomes of their parents and their peers. As a region, the South scored the poorest on both. This is not surprising given the disparities in educational attainment discussed above. (To read a summary of the mobility study, see the excellent article in The Atlantic available online here.) Generation by generation, many families in the South are falling behind economically, and the pattern is a downward spiral into multi-generational poverty. Health. The South is recognized for many negative health outcomes such as the “stroke belt” and record high levels of obesity. Perhaps the best overall indicator of health is life expectancy, and over the past few decades the South has deviated considerably on that factor from the rest of the country (see the dynamic map of this transition published by National Public Radio). Many people in the South will die ten or even 20 years earlier than persons living in the U.S. Northeast. Poverty. Not surprisingly, poverty is noticeably worse in the South compared with the rest of the country. 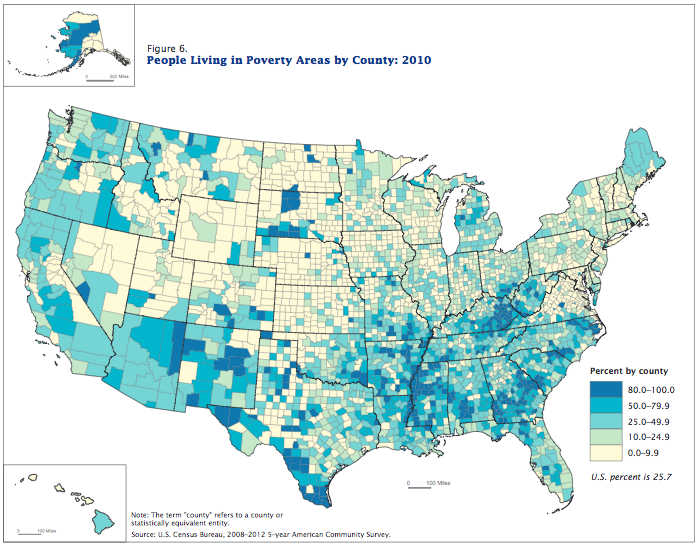 The U.S. Census Bureau map accompanying this article shows poverty rates by county in 2010. When the U.S. Census Bureau looked at changes in poverty levels by state, it found an acceleration of poverty from 2000 to 2010 across the South which was uniformly worse than the other regions of the U.S.
An integrated view. Finally, The New York Times assembles several different indicators of well-being in a 2014 story, “Where Are the Hardest Places to Live in the U.S.?” The vast majority of counties where people are doing worse based on education, household income, unemployment, disability, life expectancy and obesity are in the South. When you remove outcome statistics from the South from our national statistics, the U.S. no longer lags relative to other major industrial nations in comparisons of economic and social well-being. But those cold numbers overlook the human tragedy underway in the South. A large share of the residents of the South are suffering from problems which should be motivating their local political leaders to action. But that action is not happening. Instead, for many generations, local political and economic leaders in the South have exploited this tragedy for their benefit. As congressional representatives from the South have achieved the highest levels of power and influence in Washington, most of their constituents have experienced dramatic declines in quality of life and economic opportunity. The democratic political process in the South since the end of Reconstruction has been twisted far away from its legitimate purpose. We have a federal government for many reasons. One of them must be to intervene on behalf of decency and humanity, as well as national survival, when the parochial local leadership of a region disregards its responsibility for improving local conditions. It is time for the federal government to begin planning for a massive intervention in the South to end the disparities, and place the region and its residents on a trajectory to thrive the same as their fellow Americans in other parts of the country. No state has the right to violate the substantive due process provisions in the U.S. Constitution. The federal government has intervened in the South through the Civil Rights Act and the Voting Rights Act to overturn local laws and protect individual rights. The federal government can do this again. What is needed is not legal authority but political will. And Southern hostility to the federal government is part and parcel of what is wrong with the South in thinking that it remains somehow exempt from the overall legal rights extended to all persons. 1) Would the “consultant” perhaps be available to begin “planning” such an intervention? What would his fee be? Who would hire him? In my opinion, perhaps the author would benefit from an introductory course in American government and perhaps should be reminded that many in the South have a deep mistrust of the federal government, for reasons that the author has just verified with this article. I do appreciate the author’s disclaimer: ” I do not come at the topic of this column from a perspective of a dispassionate outside observer.” However, Reconstruction is long over. Thank you Mr. Devereux for this thoughtful article. I was born at the end of the 1950’s, in the south, which was a time of social and political upheaval. In my lifetime, the region has gradually become red after generations of being blue. Along with this gradual change, is a growing radicalization of extreme views about the role of, and even the usefulness of government. You emphasize the significance of the federal government, which essentially, has always been the significance of the federal government, to oversee the process of decency and humanity based on our constitutional values. I believe that too, but not everyone here does. There’s a growing distrust, dislike and disdain for the federal government, which, in my view, is dangerous to the sustenance of our Democracy. How can we continue to have collaborative dialogue about what plagues the south if collaboration itself is becoming a bad word. There has got to be a return to the democratic values we used to treasure. Right now though, I don’t see it. I pray that at some point, we all collectively stop, think and remember – United we Stand; Divided, we fall. Once we remember and honor this, then we can begin to address the problems facing the south. Paul Theroux has written a great book I would recommend to you both. It is “Deep South: Four Seasons on Back Roads, published 2016. It is an in depth look at Southern states, focusing on rural areas. He, too, calls for economic development, but he shows a real appreciation for the work already being done and the culture and people of the South. My objection to Devereux’s article is not his very real concern about the magnitude of the problems, but rather his proposals which are not congruent with our constitution. I don’t understand why he failed to acknowledge this. Perhaps I missed that. As an army brat, I lived in Georgia during the 50s. I also worked in the West with the Office of Economic Opportunity in the 60s.